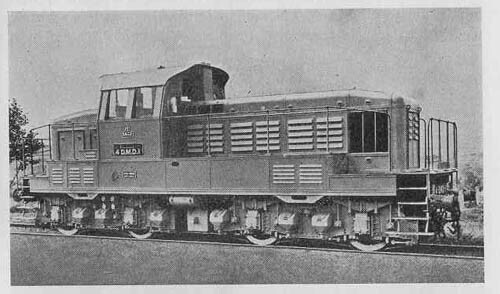 During 1932/33 the French railways took delivery of a number of standard gauge shunting locomotives including one powered by a Sulzer engine. Numbered 4BMD1 the mechanical portion was handled by Homecourt with electrical equipment provided by Alsthom. The locomotive weighed 82.5tons, with a length of 44ft 3.5in, total wheelbase 30ft 2in. The wheel arrangement was Bo-1-Bo, driving wheel diameter was 48in & pony wheel diameter 34in. The power unit was a normally aspirated eight cylinder four stroke with cylinder size of 11in bore and 13.4in stroke, providing 600hp. The generator was rated at 500V 350kW (continuous) powering four single armature nose-suspended traction motors connected in parallel and rated at 628hp (continuous) & 890hp (one hour). Maximum locomotive horsepower was 600hp, continuous tractive effort rating was 11,000lb at 14.6mph, the one hour rating was 30,870lb at 4.35mph. Maximum tractive effort was 39,700lb, maximum speed was 37mph. This locomotive was renumbered SNCF (5) 040 DA 1 in 1938 and sent to the Mediterranee-Niger in 1946, retaining its SNCF number. 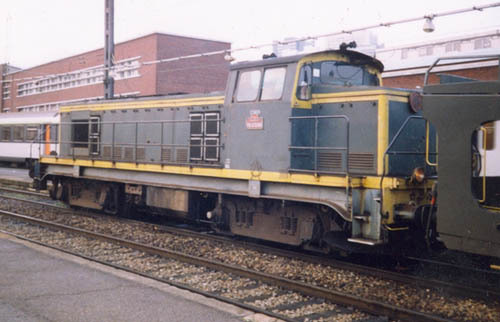 The second Sulzer powered shunting locomotive for use on the French Railways was built by CIE for use by the Chemins de Fer de Ceinture, Paris. It was powered by a Sulzer 8LD28 800hp engine and fitted with Brown Boveri electrical equipment. It had a 1B-B1 wheel arrangement. It was later renumbered SNCF 141 DB 1 and was transferred to Mediterranee-Niger, Morocco in 1947. The engine was equipped with direct injection of fuel, without the use of a precombustion chamber. The precombustion chamber allowed for partial combustion of the fuel in order for sufficient pressure to be created in the cylinder to allow for complete atomisation of the fuel. 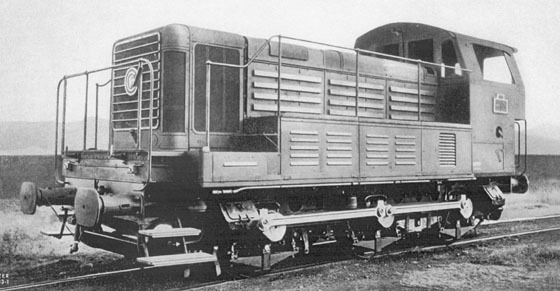 Three shunting locomotives were delivered in 1938, the mechanical portions again built by Homecourt, but Jeumont now provided the electrical equipment. The locomotives weighed 66.7tons, with a length of 40ft, total wheelbase 29ft 2.66in. The wheel arrangement was Bo-Bo, driving wheel diameter was 44in. The power unit was a turbo-charged six cylinder four stroke with cylinder size of 9.83in bore and 12.6in stroke, providing 550hp. The turbo-charger was supplied by Rateau. The generator was rated at 355V 353kW (continuous) powering four single armature nose-suspended traction motors connected in parallel and rated at 478hp (continuous). Maximum locomotive horsepower was 635hp, continuous tractive effort rating was 15,600lb at 9.5mph, the one hour rating was 18,170lb at 8.1mph. Maximum tractive effort was 37,500lb, maximum speed was 31mph. It was capable of hauling 1,000tons on level track at 18.6mph for a period of thirty minutes. Originally numbered PLM 4 DMD 1-3, then SNCF 040 DD 1-3 (1939-1962) then SNCF BB 60031-60033 (1962) - they entered service with PLM numbers but spent their entire career under the SNCF which was formed on January 1st 1938. As the PLM prototypes they were based at Paris-Bercy working duties in the freight yards and passenger station areas. Apart from being renumbered in 1939 and again in 1962 and a paper transfer in 1950 to the nearby Villenuve shed as Paris-Bercy closed nothing changed in their long lives. Thanks to their standard components they survived until 1970,1971 and 1969 respectively. For its historical significance BB 60032 was preserved at the French National Railway Museum in Mulhouse. 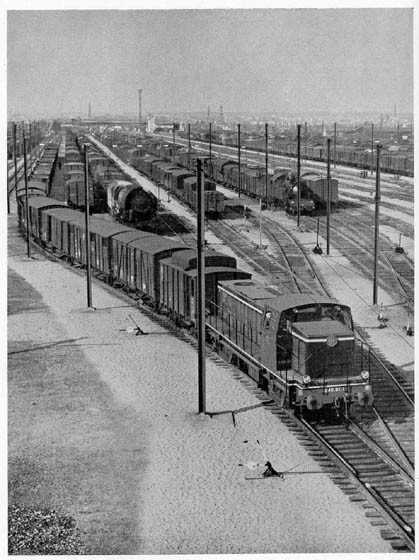 Following the end of hostilities and the return to normality a further order of forty eight Sulzer powered shunters was placed, with the first being delivered during 1950. 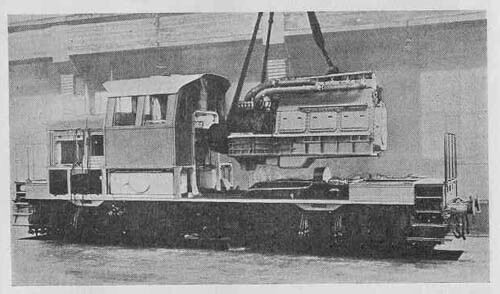 Although major changes were effected in the new design the same Sulzer engine as installed in the three 1938 shunters was fitted to this new series. Again the mechanical portions were built by Homecourt and the electrical components provided by CEM. The locomotives weighed 51tons, with a length of 31ft 2in, total wheelbase is 15ft. The wheel arrangement is a six coupled 0-6-0, outside rods connect the three axles, wheel diameter was 55in. The power unit was a 6LDA22 with the one hour output 570hp at 950rpm and the continuous output at 510hp at 890rpm. Starting tractive effort was 35,000lb. The engine-generator group is located with the generator at the forward end, in front of this is the cooling group utilising an electrically driven fan. Batteries and the motor blower group are housed in casings to the sides of the engine bonnet. Although primarily available for shunting duties, for which some machines were ballasted up to 54tons, the top speed of 37mph allowed for passenger & freight duties on lighter branch lines - one of the first delivered spent time on a branch line in the Jura Region. Originally SNCF 030 DA 1-48 then SNCF C 61001-048 (1962) they were initially attached to an large number of depots in all six regions of the SNCF as part of their dieselization, no less than fifteen depots had allocations of them by the beginning of 1954, eventually they would be allocated to a total of twenty one depots. Together with them were delivered twelve cabless booster units numbered 030 DTA 1-12 (later TC61001-012) which had the same chassis and electric traction motors of 030 DAs but no diesel engine, the engine replaced by a large weight of 42,000 lbs and a 528.23 gallon fuel tank which was connected to the main tank on the locomotive. Their weight in working order was 113,097 lbs. The locomotive & booster were used on hump duties, to be found in almost every port from Dunkirk to Marseilles. Their only line service was the pick-up freight on the Jura branch Bellegarde-Divonne-les-Bains for which a loco remained allocated to Annemasse depot until 1958. Between 1956 and 1958 these locomotives were re-allocated to just three regions (Ouest, Nord and Est) and a further concentration was made in 1967-69 leaving them allocated to just three sheds: Sotteville(Le Havre), Lens(Lille) and La Villette (Paris Gare de l'Est). At Sotteville their area of operation included the port, the passenger station and various marshalling yards. Those at Lille worked the large number yards servicing the port and the very important coalfield. This location was also a crossroads for traffic travelling between France, Benelux and the Channel ports. Paris la Villette used its locomotives to shunt at Gare de l'Est especially complete trains between the termini and a group of sidings used for stabling coaches; Vaires marshalling yard was also in their territory, from here they hauled 1,500 ton coal trains down the Paris-Strasbourg mainline to Pomponne power station; for this short trip a couple of locomotives were equipped for multiple unit operation: it was the last notable service assured for them until 1984. SNCF 61047 sometime during 1969, location unknown. 61047 entered service at Sotteville Rouen as 030 DA 47. It was withdrawn on December 31st 1981 as part of a reduction in the shunter fleet. General withdrawals begun in 1978 with Sotteville loosing the last in 1981, Lens in 1983 and finally La Villette in 1985. During the building of 030 DA class contracts were placed for four more units: two for a power station and one each for a coal mine and RATP. Around 1973 RATP launched a ten year permanent way & electrification equipment renewal program - ten additional locomotives were acquired from the SNCF and numbered from T101 to T132 obviously with many gaps between. From 1973 to 1981 a number of the C 61000's were bought by RATP (the Paris underground owner & operator) many after some years on hire. They were renumbered RATP T104 - T108 (former numbers 61019, 61025, 61011, 61024 & 61006). The T102 & T103 were filled by the Type Y 7100 diesel shunters which were delivered new to the RATP. The two locomotives delivered to EDF for Arrighi power station at Vitry sur Seine were resold to contractor SECO-Rail and renumbered 134-01 & 134-02. RATP 101 at Massy-Palaiseau 1980, in the background is T 108, obtained secondhand from the SNCF. By the beginning of the 1990's forty years of service had taken its toll (following the arrival of new locomotives similar to SNCF's BB 63500 type in 1992), eight locos were withdrawn. Eleven more locos were purchased from the SNCF by industries or preservation lines along with three booster units. Today two locos are operational in preservation while one of those sold to RATP is preserved in a museum; of the others at the end of 2001 four locomotives and a booster had been cut up while the remaining have an uncertain future (current location unknown for some). The first of the class, 040 DE 001 shunts at Villeneuve St Georges. Experience with the 1950 built 570hp 0-6-0 shunter suggested the layout of the equipment was somewhat cramped, this new series of heavy shunters/road switchers would revert to the Bo-Bo wheel arrangement as featured with the three 1938 shunters. The power unit was similar to that installed in the 1950 built machines, this model was now the 6LDA22B, set at 600hp at 900rpm, the increased output made possible by the fitting of a pressure charger. Cylinder size was 220mm by 290mm (8.7in by 11.4in). 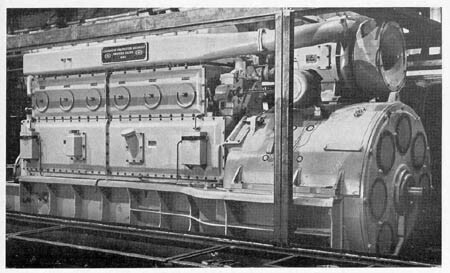 The power units were built at Sulzer's St Denis workshops and included the typical construction features for the LDA model: the standard welded steel crankcase-underbed structure, the cast steel transversals welded in, the welded steel cylinder block bolted to the crankcase and the wedge and tooth adjustable main bearings having top caps tied into the mainframe without the usual studs. The pistons are of forged aluminium alloy alloy with five pressure and two oil control rings. The crankshaft is forged in one piece of non heat-treated steel and is carried on seven bearings formed of whitemetal on bronze shells. An advertisement from the November 1953 issue of Diesel Railway Traction for Brissonneau & Lotz shows the production line for the 040 DE (later BB63000) class locomotives. The basic design of this locomotive would lead to the construction of over 800 for use in France, under Classes BB63000, BB63400 & BB63500, the latter classes being powered by an MGO V12SH of 605kW, with the final build coming off the production line in 1971! This design would also be exported to Spain (Class 307), Portugal (Class 1200), Luxembourg (Class 850/900) & Yugoslavia (Class 642/643). The Spanish locomotives were powered by Sulzer engines. The mechanical portions and the electrical equipment were supplied by Brissonneau & Lotz. Nineteen were ordered in 1951, a further nineteen in 1952 and forty in 1953. Length over buffer beams was 44ft 3in, bogie centers pitched at 24ft 6in, height 13ft 0.75in. The shunters had a somewhat American style appearance with a single full width cab with a long and short hood, the narrow hoods permitting a walkway around either end of the locomotive. The axle loading was limited to 17 tons, giving a total all up weight of 68 tons, but for those intended for hump shunting duties an extra four tons of ballast could be fitted. Maximum speed was 50mph. The frame was comprised of French bridge standard rolled I beams, the inner pair were 240mm deep, the outer pair 360mm deep. They were connected by welded drag boxes at each end and by three principal cross members. The floor plate between the pivot centers was six mm thick, at the outer ends it was two mm thick. A view of the 6LDA22B fitted in the 040 DE class, a turbo-charged engine but without intercooler. The long hood contained the engine generator set, control equipment, auxiliaries and cooling group. The short hood contained the batteries and air reservoirs. The 2,000 litre fuel tank was carried under the frame between the bogies. The bogies were of the Pennslyvania non-bolster type, helical springs supporting a compensating beam resting on the tops of the Athermos axleboxes. The bogie plate frames are 50mm thick, the frames have no end transoms, being tied together throughout the mid-length by a welded steel box carrying the center pivot. The pivoting surfaces of the members are manganese steel. The engine directly drives an eight pole dc main generator of 360kW at 900rpm with a maximum voltage of 965V and maximum current of 1,600amps. It is separately excited but has a second winding for starting. The generator is of the single bearing type but with a shaft extension to allow Texropes to drive the exciter. A double disc elastic coupling also comes off the drive extension to operate the air compressor and the traction motor blower for the rear bogie. The generator provides power for the four nose suspended traction motors, coupled in series-parallel, they have a continuous rating of 172V 520A at 285rpm. The class were intended for branch line use hauling passenger, freight and mixed trains and for shunting en-route. They were also to be made available for hump shunting. For this service two rheostats were fitted to allow the full benefit of low speed/high tractive required for hump shunting to be available without compromising the locomotive's branch line characteristics of a higher maximum speed with low tractive effort. When in hump service the movement of loads upto 1,300tons up the hump at 1 - 3mph was expected. Operation of the rheostats was partially manual and partially automatic. Starting tractive effort was 36,000lb whilst the continuous rating was 19,400lb. BB63248 runs about its daily duties at Paris Gare d'Austerlitz during March 2000. This was one of the last of the class to be built and is fitted with a 6LDA22E engine of 550kW. The immensity of its construction can clearly be seen, perhaps one reason for its longevity, by this point it had been in service for almost thirty five years. During January 1953 the first of this big class numbered 040 DE 1 began reception trials on the Nord sector of Paris around La Plaine depot due to the proximity of the builder's plant which was in Creil. All the subsequent engines were tested around La Plaine too. While other engines begun testing the first was transferred in February to Villeneuve to commence regular service. By the end of 1954 thirty seven locomotives were in traffic with another seventy one already ordered from Brissonneau & Lotz; by then all the regions south of Paris were equipped with some units allocated to six depots. BB 63010 at Tours depot on January 19th 1993. The just visible rusty wheel rims suggest the locomotive has not moved in quite awhile. A very smart looking 040.DE12 suggests that it is not long out of the workshops, date and location unknown. 040 DE12 or 63012 entered service on March 14th 1954 at Tours and was withdrawn on May 7th 1996. The last examples were withdrawn at the end of 2011. Their services were mainly pick-up freights on branch lines with the exception of Marseilles which used them for heavy shunting. From 1957 the batch 040 DE 109-158 with 725 hp engines began to enter into service and to equip the Est and Nord regions leaving only Ouest region with no allocations of this type (a substantial allocation of SACM powered 040 DE 500's was provided instead). 040 DE132 (later 63132) at Gare Du Nord, Paris date unknown. Between 1961 and 1964 the batch BB 63159 to BB 63250 were delivered with 750 hp engines. Until the early 1960's when more powerful diesels became available BB 63000's were engaged on the main lines especially on the Est and Nord which originally had only locomotives of the more powerful batches. Their main duty was the haulage of parcels trains but also the international express 2846 Paris-Bern between Belfort and Delle (Swiss border): this train was hauled in pair with a steam engine of 1-230 B (a loco visible on many scenes of the film ? ?Le Train??). BB 63108 with an interesting selection of rolling stock attached, date & location unknown. BB 63216, location unknown, sometime during 1983. 63216 was one of 55 of the class to be equipped with the 6LDA22E, producing 550kW. Photograph collection of webmaster (PO). A damp day somewhere in France finds BB 63194 moving about the yard. The locomotive was delivered during early 1962 and was one of the last of the group to be equipped with the 6LDA22D engine. A partial side view of BB 63084 reveals some of the cab & bogie detail, date and location unknown. Commencing in 1989 a number of this class of locomotives were rebuilt as 'calf' (french 'truck') units, the first to be completed was TBB 64801, rebuilt from BB 63024. A total of nineteen (TBB 64801 - TBB 64019) were converted, all from the early series of locomotives. Interestingly the first of the Class, BB63001 was converted to TBB64805. Withdrawals of the Class began in 1993, though many continued to work into 2004 & 2005. BB 63065, date & location unknown, but believed to be about 1990 - 1992. BB 63110, date & location unknown, but believed to be about 1990 - 1992. BB 63108, the last member of the second batch has reached the end of the road, seen here at Massey-Palaiseau during 2008 in its original livery. BB 63108 was the last of the batch fitted with the 6LDA22C engine rated at 440kW - the following series carried the same engine but rated at 535kW. BB 63128, date & location unknown. BB 63139, date & location unknown. BB 63143, date & location unknown. BB 63144, date & location unknown. BB 63147, date & location unknown. BB 63176, date & location unknown. BB 63013 reached preservation in the CDF museum at Mulhouse. Elsewhere some of the retired locomotives saw further use in several locations. VFLI - Voies Ferrees locales et Industrielles is an SNCF subsiduary merged from the former VFL - Voies Ferrees des Landes, commenced operations in 1998 with 63085, 63140142/143/145/157/167/168/182/188/198, 63205/209/231/232/233/237/239/244/249/250, whilst obtained for spare parts were 63068, 63152/156/170/187/197, 63207/217/228/243. Laluque Yard (Landes 40) January 10th 2004. VFLI BB 050 formerly SNCF 463168, formerly BB 63168. This locomotive was delivered new to the SNCF during April 1961 allocated to La Plaine depot, later transferred to Aulnoye, Longueau and Lens by January 1985. It was sold to VFLI circa 2000. Laluque Yard (Landes 40) October 22nd 2004, another view of former SNCF 63168 (nearest the camera), with former SNCF 63209 in the background. ASUEPA - Association Syndicale Des Usagers De L'embranchement Particulier d'Artix. The Artix site was later taken over by VFLI. Artix (Pyrenees - Atlantiques, 64) August 23, 2004 - former SNCF BB 63230 was sold to ASUEPA ownership during July 1996. This locomotive had been delivered new to Lens depot early in October 1963. It was later transferred to Aulnoye, then back to Lens. Irun (Guipuzcoa, Spain) December 15th 2004 - former SNCF BB 63245 in service with Decoexsa. This locomotive was delivered new to Les Aubrais depot late in September 1964. It was transferred to Lens in February 1990 and sold to Decoexsa in 1995. An offshoot of the 040 DE class was the ordering of five shunters powered by the Sulzer 6LDA22B engine for the industrial company Soc. Lorraine de Laminage Continu (Sollac). The conditions at the company steelworks at Seremange (Hayange is the company headquarters) required considerable alterations to the orginal design. The power unit was the same as that carried in the 040 DE class - a 6LDA22B set at the same output. It was however attached to a CEM single main bearing generator and auxiliary generator. A 96 cell SAFT cadmium nickel battery was used to motor the generator to start the engine. The four nose-suspened single reduction gearing traction motors are permanently coupled in series. Despite its shorter length the weight remained at 68tons, for the work they were intended for no expense was spared in providing a substantial frame to carry the typical loadings found in steelworks shunting. Likewise the outside plate frames of the bogies were 40mm thick braced by center transoms of the same thickness. This was a non bolster bogie with center pivot & flat sidebearers running with plain bearing Diathermix axleboxes. The locomotive was so designed that four tons of ballast could be added if neccessary. Starting tractive effort was 46,000lb, one hour wheel rim tractive effort was 27,500lb at 6.2mph, continuous was 23,000lb at 7.5mph. Maximum speed was 18.6mph, at which wheel rim tractive effort was 9,150lb. Fuel tank capacity was 220 gallons. Three more of this standard type (designated BB standard ORE classe D) were built at the Saint-Chamond factory, the last two delivered were equipped with the 6LDA22E model engine. The total of eight locomotives were numbered 461 - 468. In 1955/1956 the Saint-Charmond factory built three of this type for the Chemin de Fer Mediterranee-Niger in Morocco, numbered 030 DB 1 - 030 DB 3. Twenty nine more were built in Italy in 1960 using CAFL/CEM drawings, these locomotives however were powered by Mercedes engines. When CAFL stopped production, Fauvet-Girel built a very close model with CEM, producing something like 131 locomotives between 1957 & 1970. 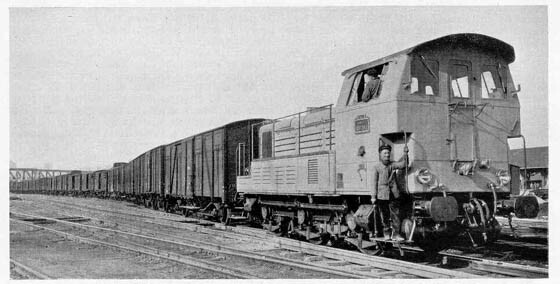 During 1954 three shunters were supplied to the Electrice de France and the de Wendel company. These were similar to the 0-6-0 shunters delivered in 1950, still powered by the 6LDA22 engine but now producing 600hp at 900rpm. 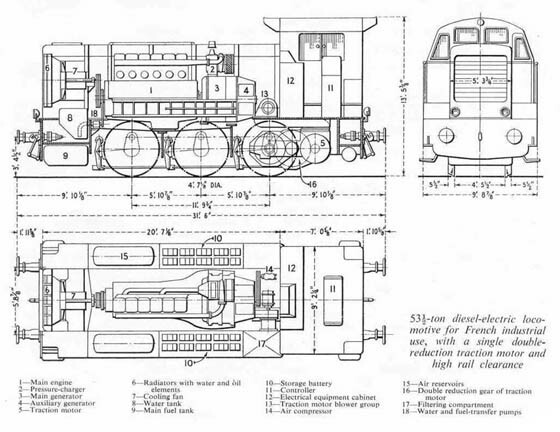 As with the 1950 series shunters the mechanical portions were handled by Homecourt, the St Denis plant built the Sulzer engines and CEM was the supplier of the electrical equipment. Although bearing many similarities to the 1950 series 0-6-0 shunters, the wheel diameter remained at 55inches, but the wheel base was shortened from 15ft to 11ft 9.75in and only one force ventilated nose-suspended traction motor, mounted at the cab end, powered the shunter. All up weight was 53.5tons, starting tractive effort was 40,000lb, one hour rating was 21,000lb at 8.2mph. At its top speed of 18.5mph the wheel rim tractive effort was 9,400lb. Detail Comparison of the French Shunters. Diesel Railway Traction, Oct 1950, Jun 1953, Jan 1954 & Oct 1954. Notes from Filippo Ricci & Jean-Pierre Vergez. Page updated October 11th 2015.